Compassionate healthcare volunteers providing free wheelchairs, rehabilitation equipment, medical clinics, healthcare instruction, dental services, food and clothing to children in despair. Active in disaster relief. 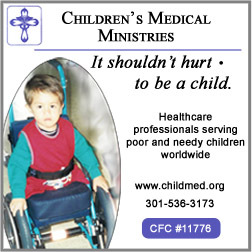 Children's Medical Ministries seated a little boy in Colombia who was born without legs. This required a special wheelchair design, low to the ground and with large wheels in front. The little boy arrived at the rehabilitation center in Bogota early in the morning, sound asleep. As soon as he woke up, it was obvious from the start that he was a man with his own mind, even at two years of age! A little explorer, he examined several chairs and quickly bonded to a blue one. The task required designing a cushion that would relieve pressure on his buttocks, plus help him maintain his balance in the chair while pushing. Starting with foam, pressure relief areas were cut out to accommodate his lower body. A seatbelt was not possible, due to the absence of hips, but a chest strap with a moderate amount of elastic give was added for safety. Success! The little boy and his parents loved it, and he happily wheeled himself around the center and out the door! It was difficult to say goodbye, but the team felt they had been able to ease, if only slightly, the burden for this one child and his parents.